I did end up making a spreader for the neck and tail blocks, as there was a small gap there that I wasn't totally satisfied with. 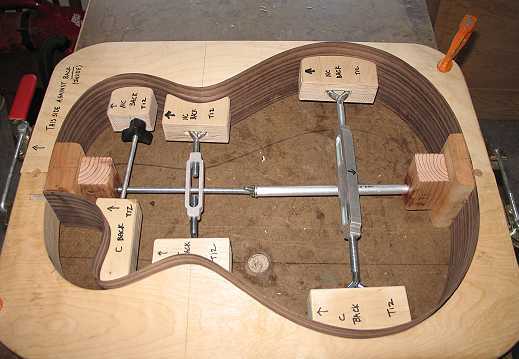 I plan to keep all the spreaders in until after the box is glued up — I will do a trial run at removing the spreaders from the soundhole, with an old top I have in my workroom, to make sure it can be done. (Also, it's a good thing I have a small hand, to more easily get around inside the soundbox!!!) I wanted to keep the spreader thin, so it wouldn't interfere with the workings of the other three spreaders, so I used Robbie O'Brien's method of using threaded rod and an aluminum tube for the spreader. 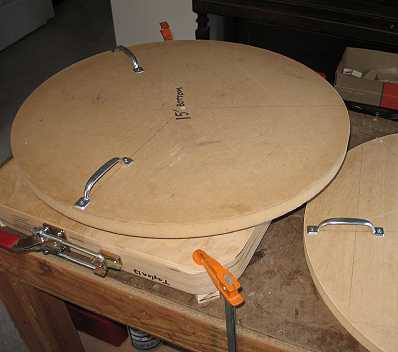 Next, I put some handles on my two radius dishes and sanded the top and back radius into the rim, before the kerfing is put on. This will make less sanding for me after the kerfing is on. This took a while, but the top and back now sit nicely in their radius dishes. 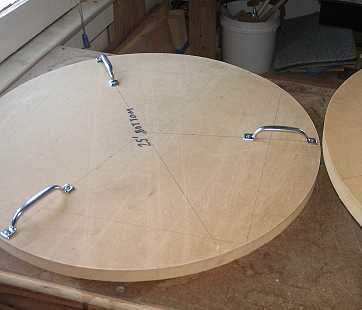 My 15' radius dish is minus a handle. I found that if I have 3 handles on the dish, it can still sit level when I'm using it normally. I need to buy another handle tomorrow! 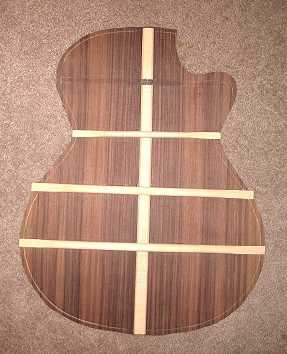 Next, I glued kerfing on the back edge of the rim. Tomorrow I'll do the top edge. Oh, and another thing: I decided to remove the top brace from my back, as it stopped short of the cutaway horn (I stopped it there because it looked as if it would run into the kerfing). 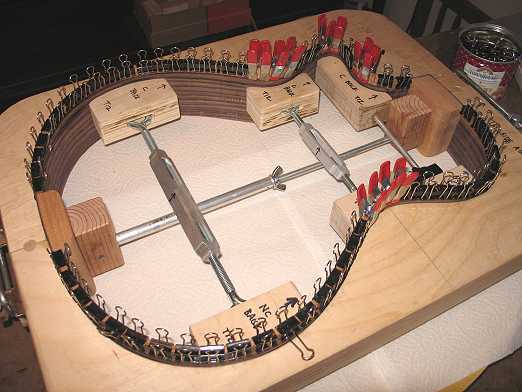 An Internet friend kindly suggested it would be better to run it all the way across, and later adjust the kerfing if some of it interferes with the brace. Well, I thought it over, and decided that probably would be a better idea. So...I removed that brace (by planing it down, then chiseling and scraping it out). I'll make a new brace tomorrow, then set the newly-kerfed rim on top of it, to see what I might need to adjust, before gluing on the brace.